When it comes to running a machine shop floor, we know that the machinists and engineers, as well as those behind the scenes managing and in IT departments, are really smart, resourceful people. We are grateful when these individuals ask us for help in optimizing their production process, whether they shop with us over the phone or just buy items off of our store without prior consultation. 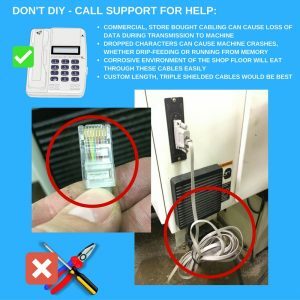 We do notice, however, and we mean no disrespect, that some of these folks make a huge assumption that cabling is not a big decision – trust us that IT IS. For those who prefer the traditional method of transmitting data via cables in their shop floors versus going wireless, there are many choices out there. 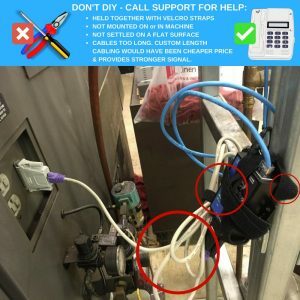 Trying to save money by using commercial Ethernet cabling, or even worse, trying to use telephone cables, can result in massive issues on the shop floor. Sure, you save money short term, but the cons outweigh the pros. 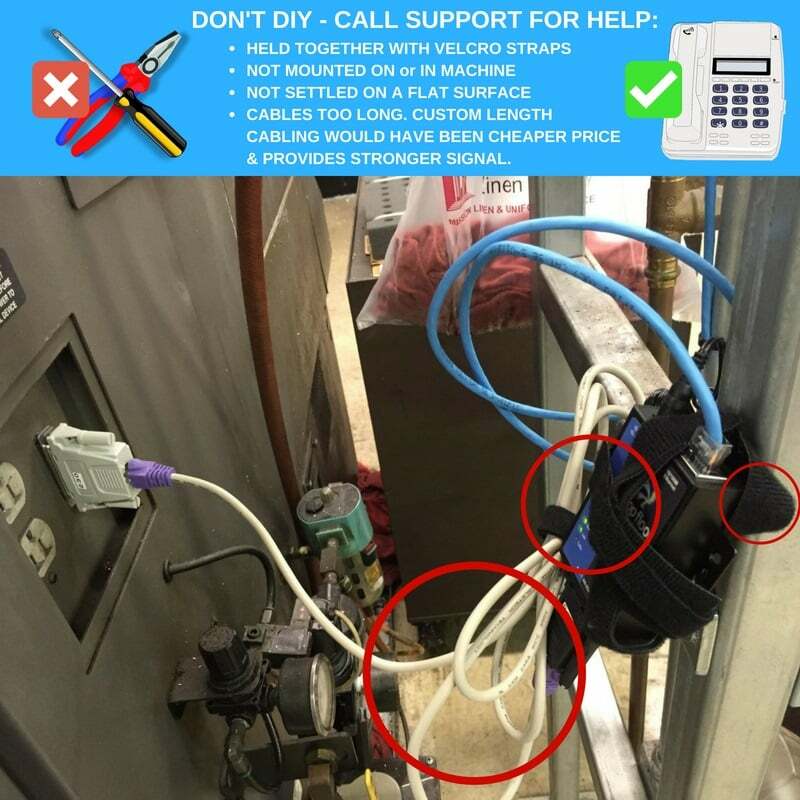 In the first photo of this post, we see that our Wired CNC Connect has been jury-rigged with some velcro straps to keep the way-too-long cables in place. While this seems like a good organizational method, this shop is potentially endangering the signal at which they are sending programs through these cables by doing this. It also doesn’t help that the device isn’t mounted on the machine, in the machine, or on a flat surface near the machine, for easy monitoring. It also looks like the device is in a location that is hard to reach, so all around, this could have been a quick setup tutorial over the phone with Support. They also could have saved money by getting shorter cabling. In this post’s second photo, we see that commercial, store-bought cabling is being used. Aside from the fact that we see the returning dilemma of the cable being way too long, there are other risks involved. With low-quality cable like this, there can be data loss during the transmission, which can result in dropped characters, which can result in a crash of the machine. Also, the harsh environment of a manufacturing shop floor will make this cable not long for this world. Custom, triple-shielded cabling made for the shop floor would have been the better choice. The bottom line of this piece is to not make anyone feel bad for the choices they make for their shop floor equipment. This is a slowly changing industry and yesterday’s solutions may not work anymore, so that is why you have come to us. We are here to help your production thrive and to also only sell you services that you need. If a shorter cable costs less but is the best option for you, that is what we would recommend. Nothing more and nothing less. Ready to see what we can do for you? Call us at (877) 611-5825 and check out our cabling solutions here.